AIM: To produce a measured survey of Church Loft as part of a National Trust refurbishment project for the village. Church Loft is a 15th-century meeting house, which is listed Grade 2* and a key building in the village of West Wycombe. 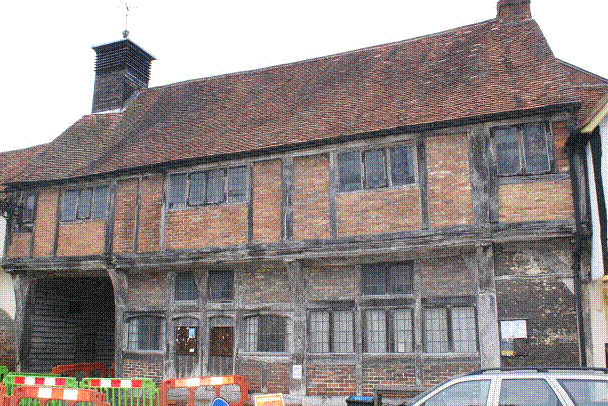 It is a two-story timber-framed building of four bays, with an offset carriage arch which provides access into Church Lane, running north from the High Street towards the church. The buiulding was known as Church House in the 17th century and would have housed the vestry court. On the ground floor there were four small rooms, which may have been accommodation for pilgrims travelling between Oxford and London or small shop units. Members of the group spent two afternoon sessions early in 2013 on a detailed measured survey of the building. The final scale drawings are in preparation. This Historic Buildings Group project is part of a much larger operation by the National Trust to investigate and refurbish all its properties in the village. The Trust took ownership of a large proportion of the village when the 18th-century mansion of West Wycombe Park was given to them by Sir John Dashwood. The Archaeological Society also funded a tree-ring dating survey of the Church Loft, in order to establish a more exact construction date for the building.